We have a vey nice puppies out of a excellent bloodline, if you intresting please don't hesitat to contact with us! Our wonderful puppies were born on 04 September (7 yellow and 3 white) Inqueries are welcome! More informations, refreshing and pictures in our FBsite! 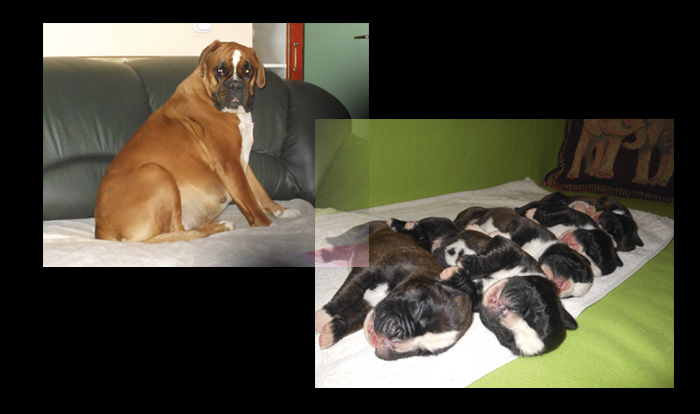 Our puppies (7 brindle females) were born on 27 February. In the Worlddogshow Paris we are got the 2nd place in the champion class under a finish judge, the first dog come from FINLAND. We want to thanks a "judging" to Kirsi Laamanen (SF)! SERBIAN CHAMPION and INTER CHAMPION, too. she is finish the titel of SLOVAKIAN CHAMPION, too! Thanks to Alex for a pictures and Attila Schlosser for a handling in the mainring! Thanks to the pictures for Denis S.! 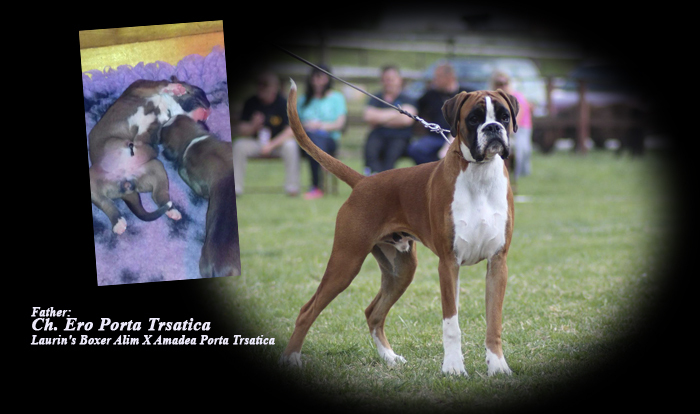 Smojver-Selimovic (CRO), who are also boxer's breeder. Mitzi won the Clubwinner in the slovakian Boxer Clubshow! my girl and to Pál Bíró the high level organisation. Ippolito del Colle Dell' Infintio the father of our "O-alom"
won the best brindle male titel on ATIBOX Worczlaw! Thanks to the pictures to Guus (Matenhof Kennel)! Mitzi have a nice weekend again!!! from the italian mating (info) on 25 April 2010. Reservations are welcome in a limited number! Mitzi won again in the dogshow Miskolc! Thanks to my friend Josef Gondos, who help me a handling! in the Champion of the Champions! Welcome in our new website! We are hope, you will be many time visit to us.